Our range of products include scrubber batteries. UNIK Scrubber Batteries are approved by Karcher Germany, TSM Italy, Ride On and various companies for use on Scrubbers and Sweepers. 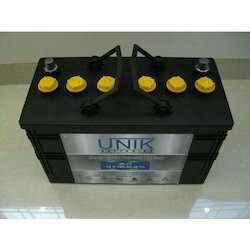 These batteries are rugged and made using tubular plates for long life. Looking for Scrubber Batteries ?